I'm currently located in Granollers, Catalonia. 2003-2007 Teacher of Qigong at Espern Activity Centre. 1999 Co founded Temperance Training as a Breathing and Self Awareness Instructor on the Gold Coast, Australia. 1998 Qigong Instructor in Odense, Denmark. 1996-1998 Founder of Temperance Qigong in Hamar, Norway. 1996-1997 Qigong instructor for SATS Hamar, and Elverum Training centre, Norway. 1995 marks my first formal lesson in Qigong. I learnt the Lohan Form at the Advance Academy on the Gold Coast, Australia. 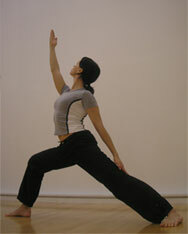 I've since studied many different styles of qigong, including different variations of the 8 golden (precious) exercises. I've concentrated on the softer version of qigong. At the moment, I'm teaching beginners yoga to private students. I have taken mini courses in 'yoga for pregnancy', 'yoga for children', 'yoga for couples' and 'yoga for parents and children'. I began teaching beginners classes at Espern in February 2004. I was interested primarily in Iyengar yoga and began ashtanga yoga in 2003. I started training seriously with Yoga in 2001. My first yoga inspiration was Light on Yoga by B.K.S. Iyengar. I moved onto Ashtanga Yoga by David Swenson. I have studied quite a few books on yoga and one of the best that can be mentioned in company with the two above is Journey into Power by Baron Baptiste. Frank, honest and totally inspiring. I taught pilates for my 'office mix' classes and at Espern. I was introduced to pure pilates in 2003 and have studied both in Australia and Norway. I taught 'Mage Magikk', one of my favourite classes, at Espern. I call it a hip and shoulder isolation work out that looks suspiciously like dancing. I designed the class myself based on Bollywood and Middle Eastern variations of traditional Belly dance with a tinge, sometimes, of raga and African beats. I've been teaching since 2006. I've been a Holistic Health Consultant for Espern activity Centre from 2005 to 2007. I make programs for people designed especially for their individual needs. I've been training in a gym since 1987. I trained and competed in fitness competitions in 1990's. I incorporate the western concepts of training the heart and muscles with the eastern concepts of training the mind and breath. I incorporate pure stretching in all of my classes. I've taught stretching classes throughout 2004 and 2005 at Espern. I've been studying Kit Laughlin's books on stretching since the year 2000. Innovative and at times miraculous information that has helped MANY of my students. An integral concept that has positively helped all of my other activities. I taught Body Balance for Espern activity centre. I was a national trainer and presenter for Les Mills Norway during 2005 and 2006. I became a certified Body Balance in Norway in 2003 at Gaz, Hamar, Norway. I taught several groups of office workers throughout the week. It's a mix of exercises that I have designed myself, to address the typical problems people face sitting at a computer for 8 hours a day. I began formulating and teaching the class in 2003-4. In the past 4 years I have trained many companies and groups, including Eidsiva Energy, Norwegian Lotteries (Norsk Tipping), IBM, Hamar Hospital (Sykehus), Probation Service for Hedmark and Oppland (Kriminalomsorgen, Hedmark og Oppland Friomsorgskontor), The Local Council (Fylket Kommune), Family Office (Familie Kontor), Sannerud Rehabilitation Centre, Ajer High School, Stange High School, the Folk Universtiy (adult education) and FO (workers union of norway). One of my pet projects is increasing the self motivation of my students. I LECTURE about self responsibility and knowledge and choices. I like to use the traditions of yoga and qigong to help us to deal positively with our lives. I have been working on this topic as a lecture theme since 2005. At Espern we had a class called 'mag og rygg'. Its to strengthen the core muscles and reduce the risk to lower back pain. I incorporate postural awareness, lengthening of the muscles supporting the hips with traditional strength work. Some of the exercises have a pilates feel. 2005 Belly Dance mini work shop with Mitra, Hamar, Norway. 1994 Honours degree in English Literature, La Trobe University, Victoria, Australia.